Photographer Nadia Mounier will hold her new solo exhibition "I will Defend Myself" at The Contemporary Image Collective (CIC), opening on 19 September. The solo show is an extension of Mounier’s work, starting early 2016, in which she “uses and restages images from the past to talk about the present,” while exploring the “representation of women in photographic images produced and circulated in the Arab region,” according to the exhibition statement. The body of work presented includes recent photographs from the latest phase titled "I will Defend Myself" as well as photos from earlier phases: “She said: I Swear I Saw a Light Coming Out of the Side of my Eyes” and “Was that Really You?” which have been exhibited before. Mounier is interested in “images that do not primarily form part of artistic image production” (such as private image archives, stock photography etc.) 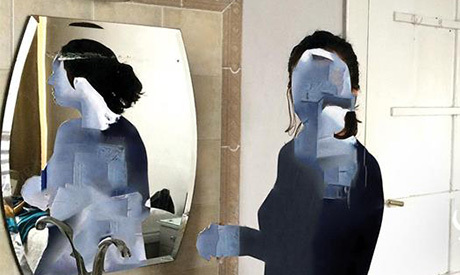 and in how interventions through editing, or covering up body parts “allows images to cross over into different contexts and other modes of dissemination while partially disappearing in the process,” the statement reads. Mounier completed her BA in Applied Arts at Helwan University in 2010, and in 2016 was part of the MASS programme for Contemporary Arts in Alexandria. Her work has been displayed widely, both locally and internationally, including most recently at PhotoCairo 6. Mounier is also a member of the Cairo Bats photo collective, among other collectives interested in the city and image production.